This entry was posted in Attachment Parenting, Balance, Family Structure, Nurturing Touch, Parenting Philosophies, Responding With Sensitivity and tagged authentic parenting, children. Bookmark the permalink. In a way, parenting allows us to repair the damage of our own childhood and create the home we needed. I grew up in a home where nurturing touches were few and far between — kind, uplifting words even more sparse. Although I love my parents fiercely, I realize that it is my responsibility to change the course and be a different parent for my own children. In my heart of hearts, I feared not being able to connect with my children. I didn’t know how to play silly games or how to roll with the punches life afforded me. However, as time has passed, I find myself longing for the snuggles of my little ones. I sneak into their bedrooms late at night, to just watch them breathe and whisper grateful prayers. Three years ago, I struggled to figure out how to play with my son; I was awkward and clumsy in my attempts to even coax smiles out of him. Liam isn’t a particularly cuddly child; his Sensory Processing Disorder prevents him from enjoying being touched constantly. If I wanted to connect with him this way, I had to change my mindset about what constitutes connecting with him. Part of Liam’s Occupational Therapy includes massage twice a day. I can’t sit and tickle his back the way my grandmother did before bed; the pressure has to be just so and only on his upper back. Working to fulfill his needs in a sensitive, nurturing manner has been a great comfort for me. 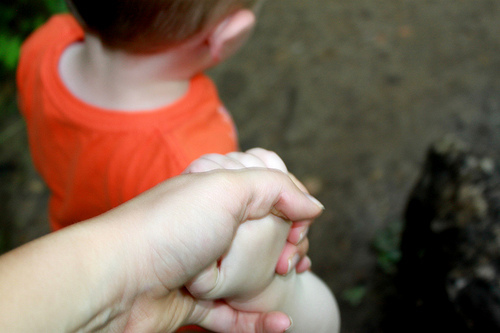 Because of my son’s specific needs, I’ve learned the true value of touch. I’ve learned how to use touch to calm and comfort. I’ve learned how to use touch to play in a fun and safe manner. As beneficial as touch has been for my son, it’s been almost more beneficial for me. Spending the time working his muscles and teaching him how to respond calmly in situations has been so healing. Every time I rub my son’s back or I snuggle with my daughter (who is on my lap, with her arms wrapped around my neck as I type), I feel my childhood insecurities fading. I know that I set out with the intention to nurture my children, but in the end, I’m nurturing myself as well. Through this experience, I can see a changed woman in myself. I no longer recoil when someone offers a hug and have been known to even put my arms out in welcome upon greeting a friend. I’m still learning to play, but it’s more fun than work for me now. I see my son and daughter running to be on my lap when I sit down, and I see a cemented relationship with my husband. I know the goal was to nurture my relationship with my son, but I think the added benefit of a mother who is healing makes this a win-win for our whole family.